"Such a great evening. I could see one of my favorite bands live, for the third time. Even technical issues during the concert couldn't ruin the performance, as good as always. I was in the first row, right in front of an excited Roger Glover, jumping around and doing acrobatics with his bass. The whole band looked happy,the vibe was way different from the days with Ritchie. The rockin' set list held a couple of surprises to me, such as Mary Long and The Battle Rages On. Speaking of surprises, there was another one: the opening act. The band was called Inquisição, from Rio, a mix of traditional metal and hard rock. Great band, great gig." 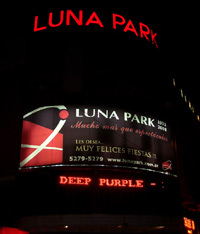 "I just came back from the Deep Purple gig in Curitiba. It was my eighth time seeing the band since their first tour here in 1991 and I can say it was one of their best performances. The venue helped, as it was packed and the sound was just perfect, clear and loud. You could hear ever nuance of the playing. The guys were on fire, especially Paicey, who had a great, great night. Gillan started the show a little bit under par - you could see he was little tired from the crazy schedule (Russia-Mexico-Brazil - but by the time they reached Mary Long he had warmed up and was just fine after that. 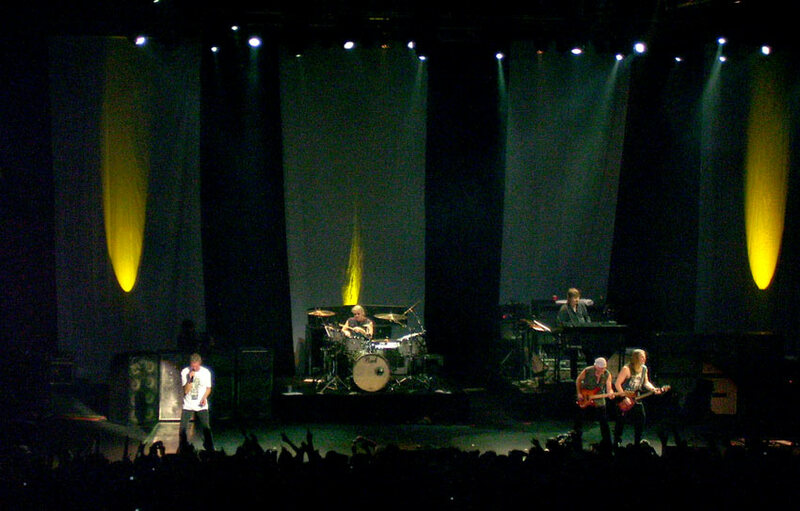 The atmosphere was simply brilliant, even though the set list was very close to the last two times the band played in Brazil, in 2005 and 2006. Clearly the crowd here will never get tired of hearing the classics. But the general vibe was so amazing that the issue of set list variation just didn´t matter really. The Battle Rages On was a nice addition to the set, sounding really powerfull. I also really enjoyed hearing Mary Long live for the first time, as it is one of my favorites of all time. Hope to hear Fools next time around! Set list: Pictures Of Home, Things I Never Said, Into The Fire, Strange Kind Of Woman, Rapture Of The Deep, Mary Long, Kiss Tomorrow Goodbye, Contact Lost, Steve Morse solo, The Battle Rages On, Lazy, Don Airey solo, Perfect Strangers, Space Trucking, Highway Star, Smoke On The Water, Hush, Black Night. "Just back at home after another DP gig in Brazil. They sound better than ever. It´s amazing see how a band can keep their charisma for 40 years! A 6,000 strong crowd are my witness! The show at Credicard Hall in São Paulo ran almost two hours, and there were a couple surprises for brazilians fans: "Mary Long" and "Sometimes I Feel Like Screaming". This last one I´m almost sure was not on original schedule! I'll explain: in one of his other solos Steve Morse decided to play a few a chords of the song. 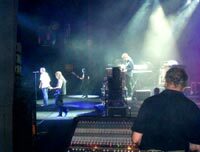 When Ian Gillan saw the crowd´s reaction he approached him and must have said something like "now we have to do that in full, let´s go ahead!". I won´t repeat all of the set list because it´s the same you all know. São Paulo was the last date of this quick tour down here. They did also Rio de Janeiro and Curitiba. Three gigs in 4 days. Tomorrow they fly to Argentina and Chile. Does it really seem that some of these guys are 60 years old?? As I said in 2005 and 2006: they´re better than ever! ENCORE : Highway Star, Smoke On The Water, Hush ~ (with Ian Paice Drums Solo), Black Night. "I've just arrived home after seeing Deep Purple live for the first time in my life, in the Estadio Regional at Concepción, Chile. Finally justice for all of us residents of Chile's "Capitol of Rock". I loved the tracklist, which contained just the right mix of the old classics, new songs and classics from between. Nice atmosphere, just great. Don Airey's solo was one of the highest points of the night, especially when he played the melody of "Gracias a la vida", probably the most important song wrote by Violeta Parra, Chile's best folk artist of all time. We will be awaiting the next South American tour, with a date in Concepción!" "At last! 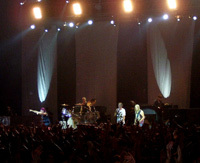 Deep Purple performed live in my home town of Concepción. 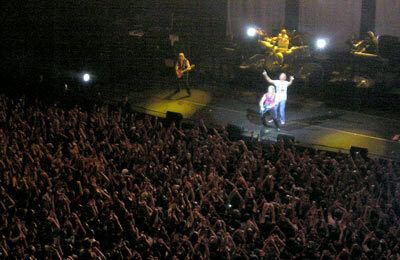 The chosen venue was the Estadio Regional, the main football stadium in Concepción. The concert was amazing. Excellent sound, great crowd, superb show! The set list was practically the same as in the previous dates of the South American leg of the 2008 tour. I was pleased to hear "The Battle Rages On", as well as "Kiss Tomorrow Goodbye" (in my opinion, the new classic heavy track) and "Perfect Strangers". The band sounded very heavy, in particular Roger's bass and Don's Hammond organ. Two technical remarks: Roger didn't bring out his trademark Rickenbacker bass during "Smoke On The Water". Don has had the guts of his Hammond organ put into a portable enclosure, so the classic beaten up Hammond C-3 is now part of history. Finally, a wild idea: Steve's solo included one Black Sabbath cover ("Iron Man"), joined by Ian and Roger on drums and bass. I thought to myself... what if he had chosen another Black Sabbath cover, one from the "Born Again" album, and then Ian (Gillan) had also joined singing a couple of verses (i.e. "Hot Line", "Trashed", etc.)?... That would have been the cherry on the cake." SET LIST : INTRO ~ FIREBALL with some bits of "Flight Of The Bumble Bee"
At this point a hot lady (wearing a small bathing costume) announced the next song! Photo and ticket scan by Vladimir Kononov, with thanks to Aleksey Kononov. © 2008 DPAS/Darker Than Blue.